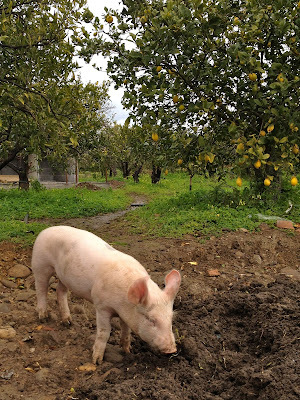 Making Room: Our Life in Sicily: a trip to the farm! On Saturday Elliott, Lena, and I were invited to a kid's birthday party. This particular party took place on a farm which, according to our friends, is overrun with wonderful animals. They were not mistaken! The woman who owns the farm has about 10 pigs (9 of which are piglets), about 8 dogs, a calf, and a goat. We stepped out of our car and spotted piglets running around... and Elliott and I were in heaven. 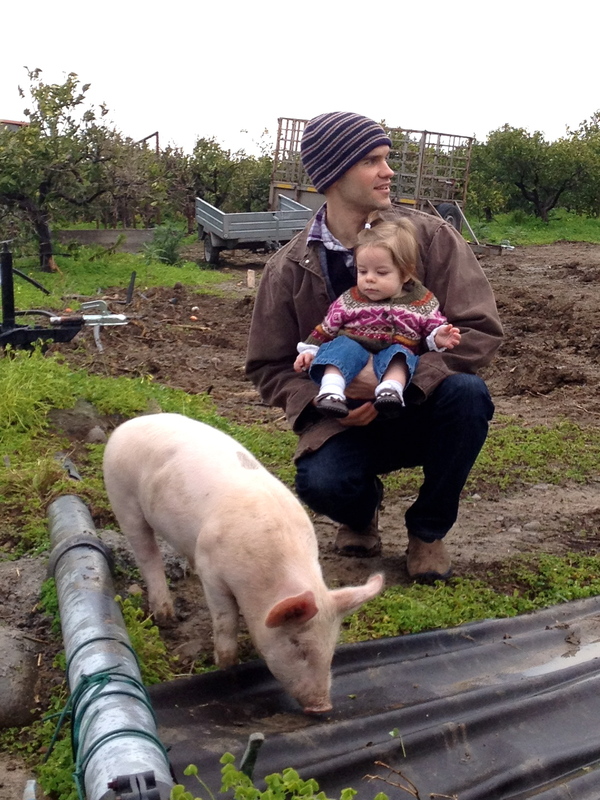 This piglet is the family favorite and gets more free rein than the others on the farm. But we spotted the rest of the crew with their mama, easy to find with your nose or your eyes! One of the German shepherds had herded this little guy into the orange groves. I tried to coax him out, but nothing doing. He was content to just stand here, tipped forward on the hill, batting his eyes at me. 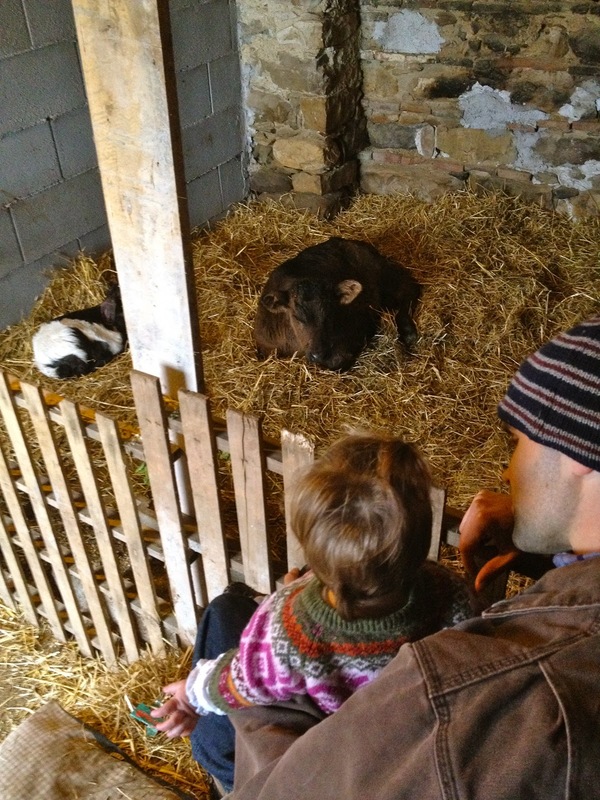 Later, after roasting hot dogs and marshmallows over the fire pit, we found the calf back in the barn. 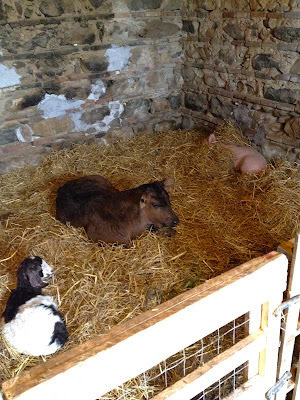 He was snuggling in the hay with his friends Goat and Piglet. ". 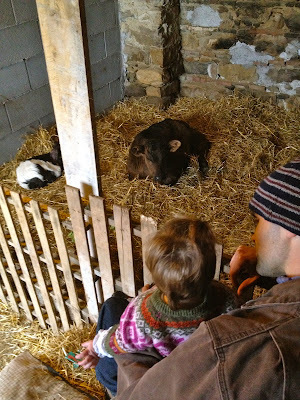 . . a real real farm. . ." Elliott! See Dad's FB posting today :). Yes, looks lovely. Shades and smells of things to come?